The next issue of Custom PC (#34 – July 2006) is out soon and it features a wealth of good stuff (plug plug! ), and one of the pieces I’ve written is a guide to Creative Commons. I’ve tried to avoid going into the morals, the whys, the wherefores of Creative Commons, IP law, DRM etc – it’s simply a very ‘hands on’ piece; about what the licenses are, how to find CC-licensed stuff, and how to get a license for your own stuff. Although all my photos on Flickr and this very weblog are CC-licensed, before writing the guide, I also wanted to create something using CC-licensed materials, just to get a feel for how easy or difficult it was. Overall, sticking to the letter of the law and only using CC materials was a mixed experience. On the one hand, had I needed audio, resources like ccMixter would have been great, and Flickr itself was brilliant, as its CC-image search pages are very easy to use, and you can find some great quality work on there. Finding text was much trickier, however: a lot of weblogs use CC-licensing, but since they’re often quoting or commenting on news, books, other happenings, there’s not a lot I found I could really use in a very practical way. The other bane of my life while putting my CC-project together was the by-nd license, which specifies ‘No Derivative’ work, meaning you can’t build on the work in any way. All you can do with by-nd stuff is copy and promote it, which is incredibly limiting. To be honest, I ended up wishing they hadn’t bothered with that one, as too many people seemed to use it by default, which meant that in the end I wrote all the text myself. So my project… it’s a guide to my favourite drink and the fuel that keeps me going, COFFEE! 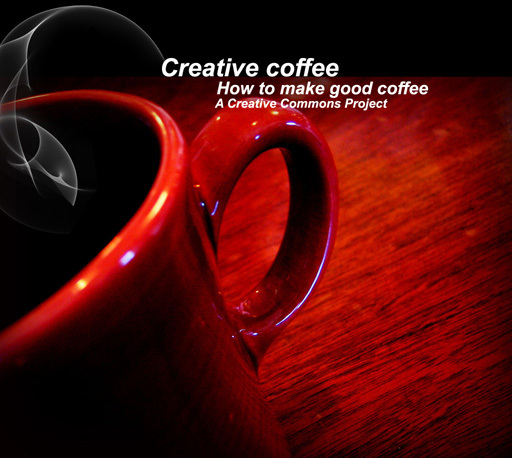 The project is called ‘Creative Coffee’, and is available to download as either an RTF file, and I’ve also put it on this weblog. It’s licensed under the Attribution Non-Commercial license (by-nc), meaning you’re free to copy, distribute, rip up, rewrite and build upon it, so long as no money changes hands. This entry was posted in Articles, Custom PC and Bit-Tech. Bookmark the permalink.